Linux is a very versatile operating system. Many high performance systems are build on a Linux OS. However, Linux can bring life to a low end machine. This way you can build your own silent Linux computer! I use a cheap 128 Mb USB pen (just € 10) to boot GNU/Linux from. It is a X workstation, the windowmanager of my choice is ratpoison. 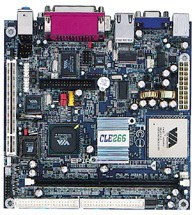 The motherboard I use is a Via EPIA ME6000. For more information on this board, see my VIA EPIA ME6000 LVDS Mini-ITX-page. This board is 100% silent (no fans) and it requires very little power. Therefor it can be powered from an 100% silent power-supply. So by eliminating the use of hard disks, the USB pen boot makes it possible to have a totally silent workstation. The processor on the EPIA ME6000 runs at 600 MHz, so this is no board to edit DVD's on. For my daily use however, it is totally sufficient. My typical use of this workstation is to have some terminal-windows (I use rxvt for this) and a graphical webbrowser for the occasional view of websites (I use firefox for this, most of the time however, I use elinks - a text mode tabbed browser). Occasionally, when I have to do things that require many resources, I boot up a more powerful workstation, but most of the time this EPIA USB pen driven machine is more then enough, saving a lot of electric power and being totally quiet as a great benefit. It is not difficult to create a bootable USB pen and install Linux on it. You too can run GNU/Linux from a USB pen drive. All it takes is an USB memory stick that you can boot from, and some work installing GNU/Linux on it. Below follows the outline how to build a bootable USB pen X workstation like I did. Maybe this can help you to get your own workstation running from an USB memory stick or inspire you to build some silent Linux system. If you have any questions, feel free to contact me (please use GPG to ensure your mail will pass my spamfilter). When the system boots up from the USB pen an image is loaded into ramdisk. This constitutes the main system. Because this main system runs in ramdisk, it is very responsive. The bigger this image is, the longer the time it takes to boot. (Booting from USB pen is rather time consuming.) Therefor I have added a second partition, which will be mounted after the initial load of the ramdisk. Download busybox, build it, after this there is a directory called _install. Add a complete directory-hierarchy to this and populate /dev with the appropriate devices. Don't forget to add a /proc directory. Also add sshd and some startup-script that loads the required modules, setup the network and starts sshd. Copy the image to this partition and name it image.gz, and add a kernel to this partition, name it vmlinuz. Boot from this USB pen and resolve any problems. Expand the _install-tree with applications. Copy ldd and ldconfig to the _install-tree. Create a /etc/ld.so.conf in the _install-tree. Check for missing libs (grep "not found"). Exit the chroot, add the libs, chroot again and run ldconfig. After adding the required application, create the image.gz again and copy it to your USB-pen (replace the former image.gz). You don't have to run syslinux again. Boot from the USB pen, test and repeat until everything is satisfactory. You can add a second partition, where you can store more libs and applications. Everything that is needed to boot must be in the compressed image, all other stuff can go here. First think where you will mount this second partition to. I used /usr/X11R6, but e.g. /usr/local could also be a good option. Make this second partition an ext2 partition. The number of writes to the memory of the USB pen is limited (typical a few thousand times) so you don't want a journaling filesystem (like ext3). I mount my second partition read-only just to be sure. Being a heavy GNU Screen user, I have found ratpoison to be a great windowmanager for me. You can choose another windowmanager off course, go for the smallest footprint and least memory-hungry manager. I got lazy and copied the firefox-tree from a Slackware 10.2 install to /usr/X11R6/lib. After adding the appropriate libs, and adding /etc/gtk-2.0, /etc/pango and /etc/fonts (all just plain copies from the Slackware 10.2) and some fonts (I used the 75dpi directory from the Slackware install) firefox can be used. (it complains about some font-conversions at startup, but it runs OK). On my 128 Mb USB stick there is still plenty of space, so more applications can be added. If you go for a larger USB pen (like 512 Mb), then your system can be populated with more applications then you will probably use. So for you too it is possible to run a completely silent workstation.